In all respects, the performances on Copland Conducts Copland must be considered as not only definitive but also, given the length of time that Copland had lived with these pieces, represent his final thoughts on each one. Clarinetist Benny Goodman began his career as a big-band leader and solo performer but, in his forties, he undertook extensive classical music training by famed British clarinetist Reginald Kell. This Clarinet Concerto, composed on commission for him in 1948, enabled Goodman to show off newly acquired skills with his instrument. The middle section contains some jazzy riffs that show off the unique sound for which Benny Goodman had become world-famous. The final selections on the program come from a three-movement suite that Copland arranged from his only full-length opera, The Tender Land, with the final two choral movements, “Party Scene,” and “The Promise of Living,” sung by the Los Angeles Master Chorale led by legendary chorus director, Roger Wagner. 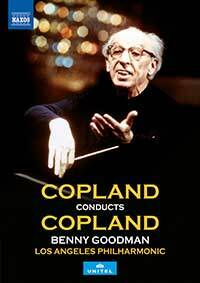 Copland Conducts Copland was filmed for television in 1976 when the NTSC broadcast standard in the United States was well below today’s standard definition resolution. By all accounts, although in an AVC 1080i/60 upscaling, this is still a “low-res” video with respect to its details and colors that are lacking in vibrancy, all in a 1.33:1 aspect ratio. On the plus side, Kirk Browning’s cameras do present a nice “you are there” feel to the orchestra, soloists, singers, and, of course, the conductor in action. The remastered audio is in decent uncompressed LPCM stereo (48kHz/24-bit). The soundstage is a bit shallow, and the strings a bit on the shrill side but this is still a very listenable presentation of some truly terrific American music. The slim program booklet has some performance credits and photos, a playlist, and a background essay on each work, followed by brief comments by Aaron Copland. This beloved American composer left behind relatively few live film documents that show him conducting his own music and with a first-rate symphony orchestra. While technically far removed from what we expect today, this hour-long program is essential viewing for those that, like myself, love this repertory, and truly shows a master at work. High recommendation.